Alchemy: Science of the Cosmos, Science of the Soul_ by traditionalist author Titus Burckhardt is a unique book which examines the science of alchemy in the light of its traditional interpretation. Burckhardt quotes extensively from such figures in the traditional school of thought as Rene Guenon, Mircea Eliade, and Julius Evola (who all had written on alchemy), as well as Carl Jung, the depth psychologist who attempted to understand alchemy in terms of the collective unconscious (relating it to the process of individuation). 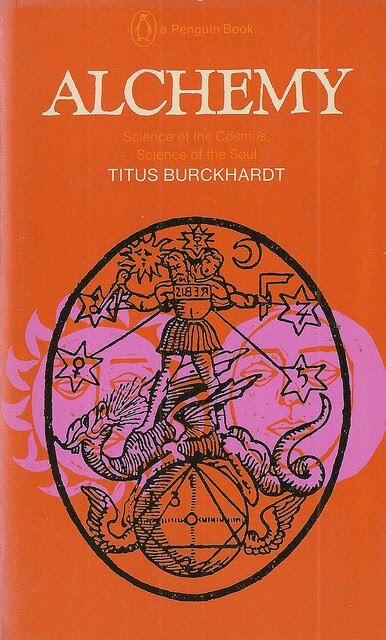 Burckhardt begins by noting that contrary to the modern historical and scientistic interpretation, alchemy was not so much a forerunner of modern day chemistry and science as it was a process of spiritual growth embodied in tradition. Burckhardt notes how alchemy had its origins in the Egyptian deity of Thoth-Hermes and in the writings of Hermes Trismegistos which came out of Egypt. Later, alchemy was to come to play an important part in all the world's great religious traditions, including Hindu, Buddhist, Chinese, and primitive Japanese religions as well as the three monotheistic religious traditions Judaism, Christianity, and Islam. Much of this book is spent discussing various source materials from these three monotheistic religious traditions as they relate to alchemical transformation. Burckhardt notes that alchemy did not derive from a desire to enrich oneself by transmuting base metals into gold as had originally been conjectured. Rather, the gold came to represent a spiritual state attained by the alchemist. Much of this book is spent discussing the seven base metals as they relate to the seven planets and the four elements (air, earth, fire, water) as well as the ether. In addition, the concept of the "chemical marriage" of sulphur and quicksilver, sun and moon, king and queen to achieve gold is explained. Various symbols including the ouroborus, the caduceus (or staff of Hermes), the Christian cross, and the seal of Solomon are explained in terms of the alchemical meaning. In addition, alchemy is related to the system of yoga and the kundalini, as well as other far eastern traditions. The athanor or the oven in which the alchemical elixer is prepared is also explained in terms of its symbolism. Burckhardt also includes a section discussing the life of Nicolas Flamel, a fourteenth century alchemist who came into contact with a special alchemical treatise. In addition, the Emerald Tablets are discussed, which reveal the principle "whatever is below is like that which is above" showing the direct relation between macrocosm and microcosm (Man). This represents an excellent source on alchemy as revealed through the lens of the traditionalist school of thought and the perennial philosophy.